than 20 years. We know your rights and we are prepared to protect them. effective in front of juries. Santa Maria, San Luis Obispo and Ventura County communities. Juan Huerta Law is committed to aggressive representation on your behalf. We prepare our personal injury cases thoroughly and we are effective in front of juries. We understand the difficulty of taking legal action when you are grieving and work tirelessly to take the burden off of you. If you, your family or someone you love has been injured or killed in an accident, we are available to assist you. 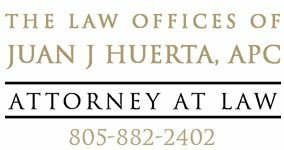 Juan Huerta Law provides experienced criminal defense representation to individuals, families and businesses on the Central Coast of California. We have extensive experience in criminal courts. Because government prosecutors at all levels of government have dedicated personnel and agencies working for them, you need a lawyer who is aggressive, active and willing to battle all the various government agencies on your behalf. Some people do not take responsibility for their actions, and insurance companies do profit by under-compensating injury victims. Insurance companies and their lawyers also know the governing laws, and they know that most people do not know their legal rights. Juan Huerta Law knows how to build your case, how to negotiate your case with an insurance company, and, if necessary, how to take your case to trial.